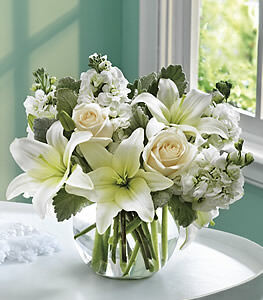 Whether its pure joy or pure love, this gorgeous arrangement of white roses and lilies is surely the right choice. White lilies, roses and stock delivered in a clear glass ivy bowl. Thank you for the notification that the flowers were delivered. I would like to take this opportunity to tell you how pleased I was when your delivery person called me to ask for assistance in making sure the delivery was made. I am very impressed with his dedication to his work and determination to get the flowers delivered. The recipient of the flowers is a close friend who lives in the area. In the future when I send her flowers, it will be through your company. Thank you again for the extra effort, and please tell your delivery driver thank you again for me.